There is nothing quite like the Power Adventure. 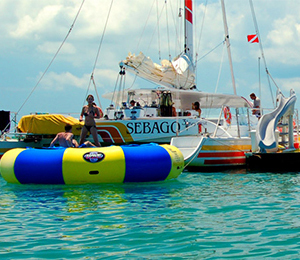 This tour is a “power”house of fun and excitement, out on the blue-green waters of Key West! What this tour offers is over ten unique water activities that all take place on a day-long cruise out to sea. Offering snorkeling, parasailing, jet skiing, kayaking, banana boats, water slides, and so much more, it is no wonder why this tour is one of our top sellers! The adventure starts off in the morning, as our guests climb on board our large, spacious and state-of-the-art catamaran vessel. This is the perfect boat for our trip as it offers plenty of room, plenty of shade, and a sturdy design to provide the most stability as we ride out to sea. The first stop on our journey is the coral reef, where guests jump in the year-round warm waters of Key West to explore the thriving marine world found beneath the surface of the water. Countless species make their home in these waters and you are likely to see a large chunk of those species. This is a great part of the tour to have your underwater cameras with you! After the snorkeling, it is time for more fun and excitement! Here is where the rest of the activities take place. You can basically do the activities in any order you want. And trust us, there is plenty of time to do all the activities! By the end of the activities, you will be worn out and ready for a nap! The activities are fun and easy and are great for people of all ages who love getting out on the water and being active. Parasailing takes you up in the air some 500 feet, jet skiing takes you riding through the waters at speeds of up to 40 miles per hour, and the banana boat will have you howling! Book this tour early as this is one of the ones that fills up the fastest, usually days and even weeks in advance!